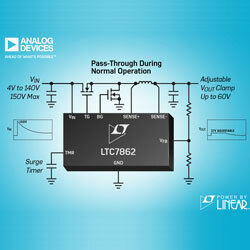 Analog Devices now offers the Power by Linear LTC7862, a high efficiency switching surge stopper with overvoltage and overcurrent protection for high availability systems. The device drives an N-channel power MOSFET stage. During normal operation, the device passes the input voltage through to the output with a minimum of conduction loss. When an input overvoltage condition occurs, the device starts switching as a high-efficiency DC-DC regulator, protecting critical downstream components by restricting the output voltage and current. The device builds on popular linear surge stoppers such as the LTC4363 by providing high-efficiency switching protection to increase output current capability and decrease power loss during transients and faults. Supply voltages surge when the load current alters abruptly in long inductive power busses. The condition is aggravated in automotive applications by the energy saved in the alternator’s inductance, causing an elevated and extended voltage surge through a load dump. The power handling ability of a surge stopper is restricted by the power lost in the protection circuit. In a linear surge stopper, the power ability is defined by the size of the pass MOSFET, while in a switching surge stopper the power ability is defined by conversion efficiency. Due to its lower power loss, a switching surge stopper can work through longer input voltage surges at a higher output current than a linear solution. The device has an input voltage operating range of 4V to 140V, 150V abs max. An external fault timer capacitor configures the restricted time spent in overvoltage mode and keeps the switching surge stopper below a safe peak operating temperature when power loss is at its highest levels. The fault timer saves system cost and size by enabling component selection to be optimised for normal mode rather than overvoltage transient and fault conditions.